Interactive HTML enables you to share JMP reports that contain dynamic graphs so that even non JMP users can explore the data. The JMP report is saved as a web page that includes interactive features, which you can email to users or publish on a website. 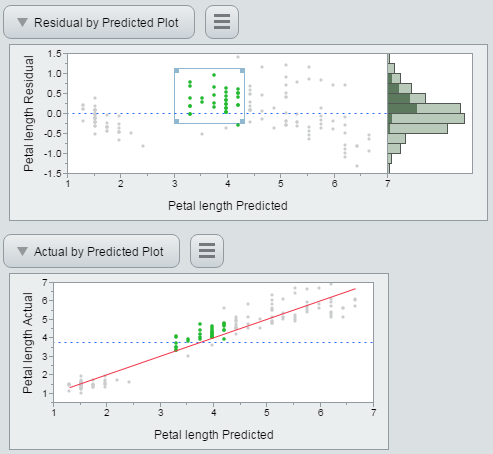 Users then explore the data as they would in JMP. Explore interactive graph features, such as selecting histogram bars and viewing data values. Show or hide report sections. Many changes that you make to the graphs, such as ordered variables, horizontal histograms, background colors, and colored data points, are saved in the web page. Graphs and tables that are closed when you save the content remain closed on the web page until the user opens them. In JMP, create the report and make it the active window. Select File > Save As and select Interactive HTML with Data from the Save as type list. On Macintosh, select File > Export > Interactive HTML with Data. (Optional) To avoid opening the HTML file in the default browser after saving, deselect Open the file after saving. Name and save the file (or export on Macintosh). The output is saved in the selected folder. When you save a report as interactive HTML, the Save Report As window warns when one or more features in the report are not supported. If the contents are fully supported, output is created with no warnings. Partially or unsupported features are still saved in an interactive web page. When you place your cursor over an unsupported feature, a tooltip states that the feature is not yet interactive. For information about exploring interactive HTML output, visit https://www.jmp.com/support/help/InteractiveHTML/14/ShareJMPReports.shtml.